The 900Global Absolute Truth bowling ball will "absolutely" rock you to your core. Speaking of core, this ball contains the Adaptor/C Symmetric core that provides quick revolutions and 5" plus of flare potential! The S80R Hybrid Coverstock is the most aggressive coverstock, used best in medium-heavy to heavy oiled lane conditions. This ball uses the Adaptor/C Symmetrical core and the new S80R Hybrid coverstock. The Absolute Truth is an easy ball to read. It is not angular, but it still has a strong backend motion, not a skid flip kind of motion, but stronger than I thought it would be… And at the same time, it has a strong midlane read, but it is not as early and smooth either. The Absolute Truth finds a good balance between providing a predictable motion and a strong move down the lane. I started laying the ball around second arrow and having 4-5 as my breakpoint. The Absolute Truth revs up quickly thanks to the big Adaptor/C Symmetrical core but it never quits or rolls out. It provided enough length and a strong backend motion. I had to be consistent with my speed to keep the Absolute Truth on the left side of the lane. When I slowed down, the ball went high most of the time, while when I kept my speed or even when I hit the ball a little bit harder, the ball always picked up right on time and never went past my breakpoint. It offered me a lot of margin of error while missing in or missing out, as long as I kept my speed, the ball always hit the pocket, the ball made me feel like I had about 5 boards to miss and still hit flush. I moved in and started playing around third arrow and surprisingly the ball offered enough recovery down the lane. Due to my low/medium rev rate, there are only a handful of balls that allows me to play that part of the lane and this is one of those balls. I wasn’t expecting that from this ball since the cover is so strong than I thought that the ball will have no energy left to recover down the lane, fortunately I was wrong. The Absolute Truth allowed me to swing the ball in a part of the lane that it is definitely not my A game and still provided me with a consistent reaction. I compared the Absolute Truth with the strongest ball in the 900 Global lineup, the Inception DCT. The DCT is definitely stronger than the Absolute Truth. The Inception DCT reads the lane earlier, and it has a smoother motion down the lane. Overall, It has more hook potential than the Absolute Truth. 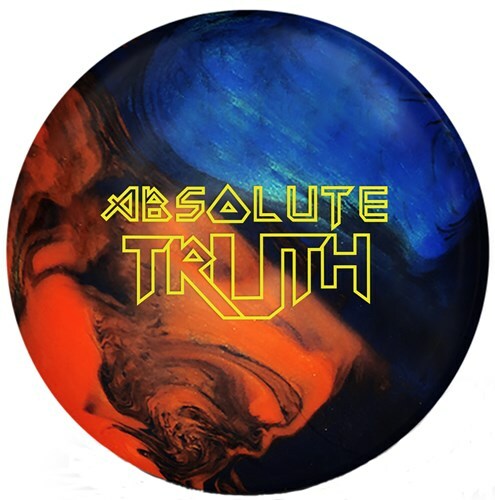 The Absolute Truth is a versatile ball that will fit into a lot of bowling styles. On fresh this ball can be used to play straighter angles and when you need more shape down the lane. This ball will also be a good option for the transition. Even with its strong coverstock, the Absolute Truth can be used to play different part of the lane. I feel like this ball complements perfectly the rest of the 900 Global lineup. It is a good step down from balls like the Inception DCT and it offers more hook potential and a different shape from balls like the Truth Pearl or solids like Covert OPS or the X2. The Absolute Truth offers a good balance of control and a strong backend motion on most medium and heavy oil conditions. I am just an average bowler, I don't work for any company nor I am on staff with any ball company. on this one. You need to get one. The new Absolute Truth from 900 Global has already proven to be a very versatile, yet very controllable, addition to my arsenal. The hybrid coverstock does a great job of getting through the front part of the lane without burning up, yet has the teeth to consistently make the corner with a predictable motion off the dry. Was able to use this on both a fresh THS, as well as a burnt up THS, as the ball was able to fight through the carry down and retain enough energy to carry very well during games 2 and 3 of that set. This is a ball that will never leave my bag and will likely be a go to on heavier oil patterns in the future. The Truth, the whole truth, and nothing but the truth! Join Lane Side Reviews as they take the new 900 Global #AbsoluteTruth to the lanes! The Absolute Truth brings the Hybrid S80R coverstock that is used on the Inception Redux to the Truth line. This coverstock is strong, as many of you know from throwing the Redux. This Hybrid coverstock allows you to have the best of both worlds when it comes to solid and pearl coverstocks. The pearl allows the ball to clear the heads with ease and then you gain the ability to have the strong motion in the midlane and the backend you get with solids. This ball is meant for medium to heavy lane conditions, but don’t think you can’t modify the cover to accommodate other patterns but still get the same heavy roll this ball provides. You can see this ball working its magic due to the color scheme, which makes it super easy to read. Get one and see for yourself! This is the absolute truth, period! The Prime 800 Series Absolute Truth, is exactly that the TRUTH. The S80R Hybrid cover combined with the Adaptor/C Symmetric core gives you a piece that can handle medium to heavy lane conditions. The ball revs up quickly in the mid lane, which will give you a consistent finish to pocket with increase hitting power on heavier oil lane patterns. My ball is drilled pin down below the ring finger with the CG kicked out to the right. My fellow low to mid rev players will enjoy this ball. This is a great ball to have in your bag, get one today! Page created in 0.653 seconds with 22 queries.